The start of 2019 offers an opportunity for players on the world’s leading golf tours to have a fresh start and focus on targeted improvements as they chase victories and world ranking points in the year ahead. Although the 2018/19 season officially started back in the autumn, the majority of the leading contenders on the world’s two major tours wind down following the season ending championships, switching thoughts to performance reviews, swing changes, strength and conditioning work and all important down time with the family. As we embark on 2019 travel itineraries are likely mapped out for the year ahead, and with the shift in scheduling (moving The Players to March) our clients are teeing it up earlier this season in order to sharpen their games in tournament conditions. Despite the earlier start, swing adjustments are still being honed, and freshly optimised practice regimes implemented as the world’s best seek to improve on last season’s performances. Irrespective of their current form, even if a player shoots the lights out and has five wins in a season, they can always win more tournaments, shoot lower scores, acquire more ranking points – aspire to be a better version. You only have to look as far as Tiger in the early 2000’s, who in spite of holding all four of golf’s majors at the same time was relentlessly seeking any potential edge on the field. Consistent with any professional sport or indeed any high performance role, the appetite to continually pursue this marginal improvement is what separates the best from the rest. Marginal gains. The accumulation of small improvements can yield major returns when aggregated over a season as long and demanding as the global golf tours. 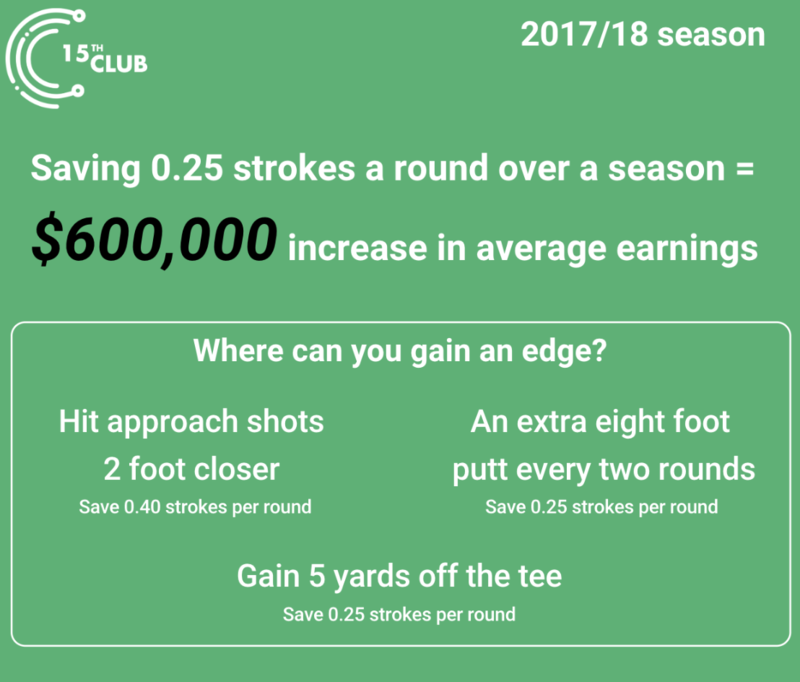 Data from the 2017/18 season showed us that improving by 0.25 strokes a round, when compounded over a season, leads to a $600,000 increase in average earnings for a player on the European Tour. We are able to drill down an extra layer to establish the specific contributions of the players profile. On average an extra five yards off the tee saves 0.25 strokes a round. Hitting approach shots 2 foot closer saves 0.40 strokes a round, compelling information for the players performance teams to act upon and maximise return on time in what is a very compressed period for game improvement & targeted interventions. Our proprietary software platform, Waggle, arms the worlds best players, their caddies, agents and support staff with a unique perspective of their game, revealing the true drivers (or blockers!) of performance. Waggle Lite is available to any golfer on the European Tour by virtue of our partnership with the tour and their commitment to supporting their members and player development. With Waggle Lite, the players are able to access strokes gained information against the field, identifying the top three and bottom three strokes in a round as well as their traditional stats. A more advanced option, Waggle Elite, permits players to engage with more enhanced statistics and deeper personalisation allowing easily identifiable trends and patterns across multiple tournaments. Actionable insights grounded in objective data present a very trustworthy justification for adaptations to a players swing, practice schedule and course management. For those wishing to subscribe to our most granular and powerful solution, Waggle Insight, players get access to unparalleled performance insights from our dedicated team of world class analysts, disseminating critical aspects of their game. We conduct performance reviews, facilitate gap analysis, optimise schedules, work closely with swing/putting/mind/physical coaches to interrogate the data, revealing strengths and highlighting blind spots to better shape interventions and significantly improve chances of success. Our stable of players amassed 87 Top 10 finishes last season. We are under no illusion, we are but one part of the performance puzzle, it is however very apparent that we see growing significance and increasing relevance of data driven decision making amongst the games elite.There is of course more than one way to skin a cat, and players have very different approaches to analysing their game, whether that be from experience and intuition lead or fuelled by artificial intelligence and huge data sets. There is no one size fits all approach, we advocate leveraging the best of both worlds and are committed to innovation at this human/machine junction, driving sustainable improvements in performance. Roll on 2019!